Yes, I know full well that today is Independence Day in the United States; a day filled with parades, barbecues, and fireworks. But people hardly need to be reminded of that fact. So instead – so as not to stray too far from the theme of the day – I am going to celebrate the birthday of Stephen Collins Foster, sometimes called “the father of American music.” Those of us who come from parts of the Americas south of the equator are not entirely thrilled that the U.S. has usurped “American” but I’ll let it slide this once. 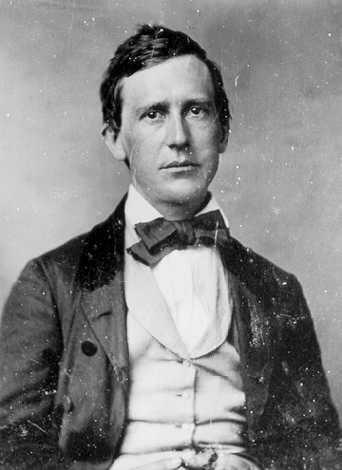 Foster was born on July 4th 1826 in Lawrenceville, Pennsylvania (not far from Pittsburgh). For some reason his life and work are filled with common assumptions which are entirely false. He was not, for example, an unlettered spendthrift who dashed off tunes to make a buck and died a penniless alcoholic. It’s true that he died in poverty at the age of 37, but the rest has no merit. He was a hard working, well educated man who made up his mind to be a professional song writer in an era when such a thing was virtually unheard of. Consider this. Foster lived in an age before records and radio; in an age when copyright laws were almost completely ignored; in an age when there were no such things as performance royalties nor hungry lawyers waiting to take people to court for performing without paying such royalties. His only income was either from royalties paid for the sale of his sheet music by the original publishers, or else from outright fees paid at the time of publication. For “Oh, Susannah,” for example, he was paid $100, and received nothing from its performance nor from unscrupulous publishers who took the sheet music and printed their own versions. 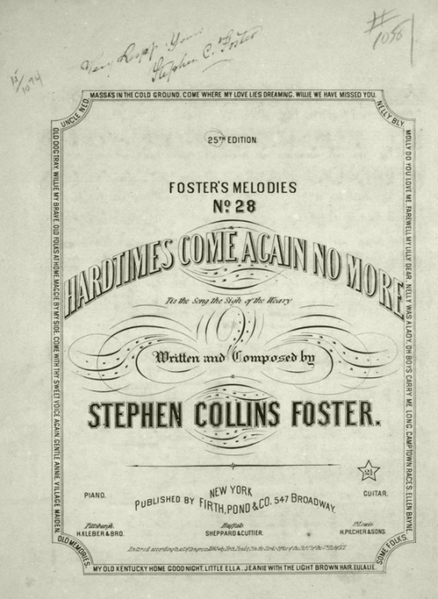 Many of Foster’s songs are often now considered to be nostalgic hymns for the old South. This is also unfair. Foster died in the midst of the U.S. Civil War and he was an abolitionist. He was not a Southerner, and barely visited the South. He was not writing about the “good old” past. He was writing about his present in which he saw much he wished could be changed. Many of his songs were written for minstrel shows where the performers were white men in black face. But he insisted that there be no buffoonery or mocking of slaves as was common in black face performances of the time. His whole point was that people, slave or free, are subject to identical emotions – love of home and family, care for those in need, desire for a better world . . .
Maybe some of his best loved works – “Camptown Races” “Old Folks at Home” “Jeanie with the Light Brown Hair” “Beautiful Dreamer” – are a bit dated and quaint nowadays, but I still see teary eyes in the stands as people sing “My Old Kentucky Home” while the horses parade to the starting gate for the Kentucky Derby. He captured something everlasting. My favorite is a song that still gets a lot of air time and has been recorded and performed innumerable times: “Hard Times, Come Again No More.” It is a fitting epitaph to a man who deserves our praise for his endurance of suffering along with his sorrow for the suffering of others. Foster died in New York impoverished and alone. He was living at the North American Hotel at 30 Bowery on the Lower East Side of Manhattan. He was reportedly confined to his bed for days by a persistent fever. He tried to call for a chambermaid for help in his delirium, but when he got out of bed he collapsed, falling against the washbasin next to his bed and shattering it, which gouged his head. It took three hours to get him to Bellevue Hospital. In an era before transfusions and antibiotics, he succumbed three days after his admittance. His worn leather wallet contained a scrap of paper that simply said, “Dear friends and gentle hearts,” along with 38 cents in Civil War scrip and three pennies. Although it is not the right season I have to include a recipe, of sorts, for Kentucky burgoo in Foster’s memory. The order on Derby Day goes as follows: mint julep (or two or three), singing of “My Old Kentucky Home,” the race, burgoo and cornbread. Maybe there are more mint juleps in the gaps. This “recipe” does not have the usual list of ingredients (in Imperial and metric measures) followed by a detailed set of instructions. I just don’t cook that way – not for burgoo, nor anything else for that matter. I’m a great fan of dumping stuff into a skillet or pot (based on what I have to hand), and letting things happen – tasting all the time to make sure that what I dish up is worthy. Making burgoo is a two day process (at least). First day you cook the meats. There are no set meats. In “hard times” people put whatever they could find into the pot – rabbit, dove, crow . . . anything that came along. But, you MUST include at least two meats. Typically I use about 2 lbs of stewing beef (bone in), ½ lb of salt pork, and a whole chicken jointed. Put the meats into a big pot and cover them with a rich stock. Here’s the part that all modern recipes I have read fail to appreciate: you must cook the meats until they are absolute rags. That means 3 to 4 hours on a slow simmer. Take the meats out and reserve the stock. When the meats are cool enough to handle, strip them from the bones, shredding them as you go. Return the shredded meat to the stock and refrigerate overnight. Second day, reheat the meat and stock, and add your choice of vegetables. It is essential to include canned tomatoes (and if you are a good Southerner you will have canned them yourself). After that I add corn stripped from the kernel, lima beans, and okra. If you choose you can include bell peppers, potatoes, and I don’t know what else. I have my preferences, you are allowed yours. You then cook it all down until it thickens on its own – maybe another two hours at minimum. Don’t listen to anyone who says you should add thickening agents such as flour or cornstarch. They are heathens. Do, however, add salt to taste and mountains of fresh ground black pepper. Some people (myself included) like burgoo served with pepper sauce. Whatever your choice, you must have cornbread with your burgoo. You really cannot make small quantities of burgoo. My version typically serves about 12 people. As with any stew, burgoo is best the day after it is made.